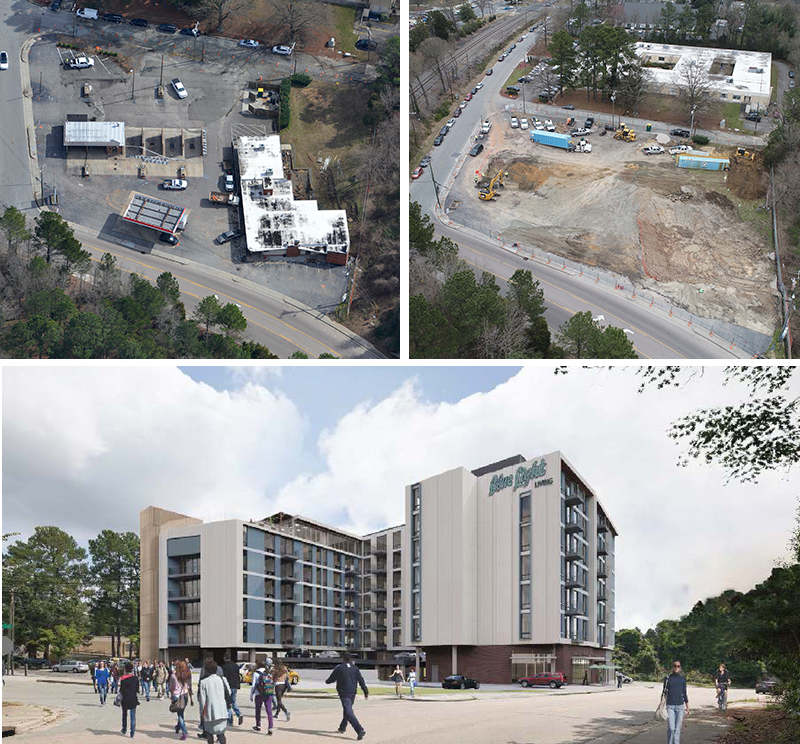 Construction is underway on The Blue Light – a 7-story apartment project that LeChase is building for Wilmorite in Durham, North Carolina. The developer expects that the property, when complete, will attract upper classmen and graduate students from nearby Duke University. The name Blue Light pays homage to the Blue Light Restaurant that originally occupied the space from 1949 to 1974. After it closed, the restaurant had been converted into a convenience store, Sam’s Quik Shop, which was demolished for the apartment project. The new Blue Light will have 80 units made up of a mixture of two- and three-bedroom apartments along with retail and restaurant space on the first floor. Amenities will include bike storage, a mail/package room, resident study rooms, group fitness and exercise rooms, individual unit balconies, an outdoor patio terrace, covered rooftop lounge and rooftop warm and cold water spas. The project is expected to be completed in August 2020. Images below show the site before and after demolition, as well as a rendering of The Blue Light project.